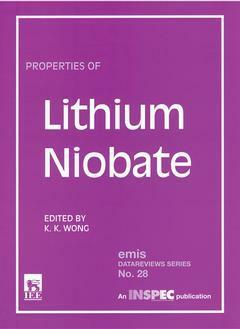 Properties of lithium niobate WONG K.K. The use of lithium niobate in signal filtering in TV sets and video cassette recorders is well established and it is finding increased application in optoelectronic modulation devices in DWDM (dense wavelength division multiplexing) fibre optic systems. Much LiNbO3 research has taken place in recent years. This fully illustrated volume brings electronic engineers, materials scientists and physicists up-to-date by enlisting the expertise of active researchers and presenting their considered reviews in the modular form which characterises the Datareviews series. Stoichiometry. Crystal structure. Phase transition temperatures. Point defects. Cz, Stepanov and epitaxial growth. Fe-doped boules. Structural phase diagram and compositions of phases for PE waveguides. Compliance and stiffness. Photoelastic coefficients. 3rd order elastic coefficients. Yield stress. Thermal expansion, conductivity and diffusivity. Specific heat. Electrical conductivity. Pyroelectric coefficients. 2nd and 3rd order piezolectric contants. Electrostrictive constants. Electromechanical coupling. Dispersion data. Dielectric constants. Electro-optic coefficients. Photorefraction. Refraction and 2nd order nonlinear optical properties, IR spectra of different phases in PE waveguides. Photorefraction in Cu-doped PE waveguides. Luminescence and Raman spectra. ESR of impurites and defects. OH ion spectra. Stark effect of RE dopants. SAW velocities and attenuations.Poling. wafer preparation. Chemical etching. Ion beam processing. Excimer laser treatment. Er doping by thin film diffusion and ion exchange. Uniformity studies by Maker fringe analysis. Secondary ion mass spectrometry. m-lines spectroscopy. Microanalytical techniques. Radiation effects. Holographic processes. Dynamic properties, optical damage, related issues and stabilisation.Optical waveguide technologies.